Sep 28, 2017 | What Am I Reading? The best poetry is at its most beautiful when read aloud, the sounds exploding from the tongue, the rhythm beating a steady accompaniment to the words, the metaphors creating imagery that bolsters our imagination. 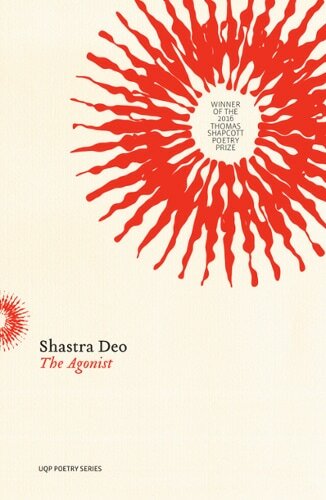 Shastra Deo was awarded the 2016 Thomas Shapcott Poetry Prize for her collection The Agonist (UQP 2017), and one of the great delights of this anthology has been listening to Shastra read her poems aloud on several occasions. Her voice is unique and arresting and her tone is engaging. Her poetry seems to emanate from a raw wound as she dissects the human form with her words, cutting into the flesh, flaying open the skin, peering into the organs and investigating the body’s systems. Her work is informed by her explorations of the brokenness, fracture and repair of the body. Her poems investigate what happens after we die, how the self remakes, how our spirit lingers, how our temporal husk and our physicality aligns with our soul. This is a collection about love, and death, about renewal and haunting, about fecundity and desiccation. Like all anthologies, these poems will have different meanings for different readers. Individuals will bring their own perspectives and come away with their own understanding. But to everyone I would highly recommend reading the poems aloud to allow Shastra’s penetrating voice, her sharp and visceral language, and her intonations both soothing and invigorating to be heard, in order to fully appreciate the talent in this collection that is daring, brave, direct, unguarded and exposed.